OK, JewishMOMs, here’s our final semifinalist! Soon you’ll have your chance to vote for your favorite, and the winner will receive $100! This is my home. 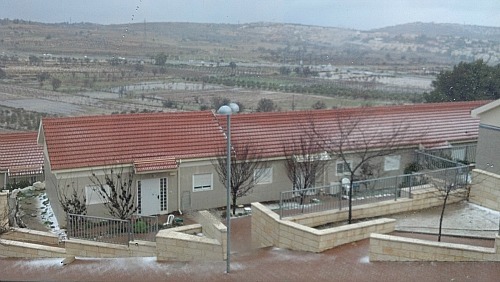 It’s a simple ‘caravilla’ near where my husband is learning in kollel, but it’s nestled sweetly in the hills of Judea. For that, I am grateful. This is my friend Ariella. 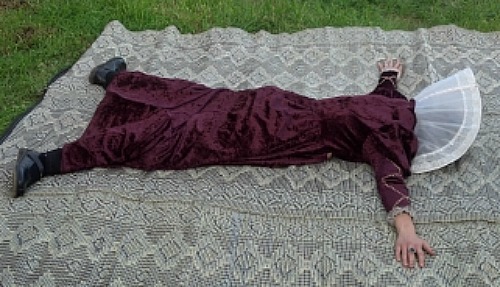 She’s hugging the earth. On purim. I’m grateful for my friend. 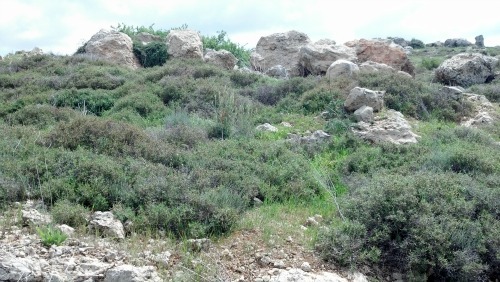 This is a field in Migdal oz by our home. My husband goes there to do hitbodedut. I am grateful that we have a beautiful place to go and speak to Hashem. 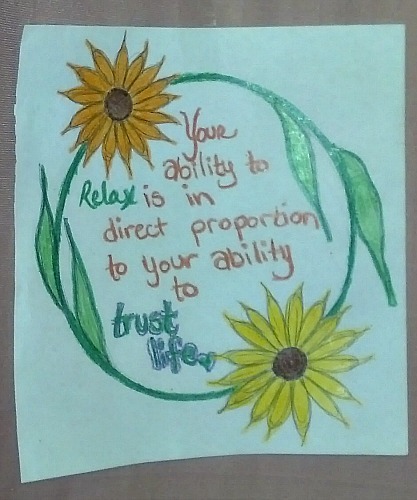 This is a sign my friend Syma made for me to take to my recent birth, as something to focus on and give me chizuk. I had a successful VBAC 7 months ago during my daughter’s birth. I’m so grateful. 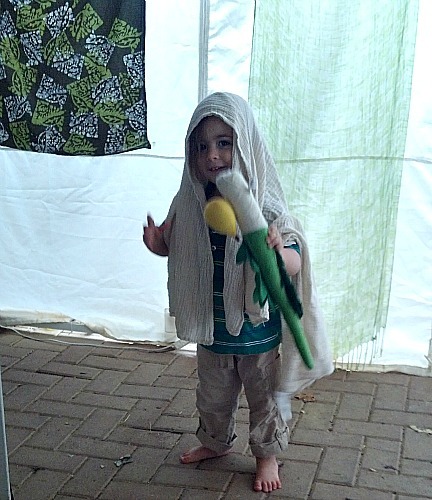 This is my son, Akiva Chen, davening in our sukkah. 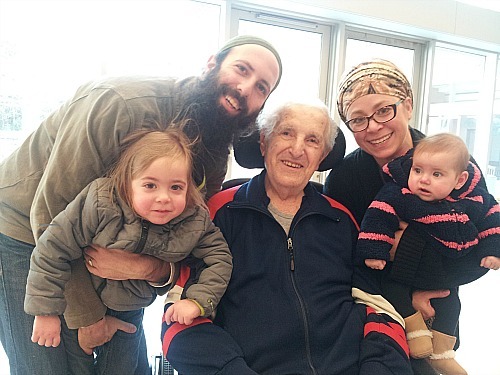 I am so grateful that I am raising children connected to Hashem, mitzvot, and Eretz Yisrael. This is my family with my husband’s grandfather. He passed away last week. I am so grateful we were all able to see him last month one last time. This is my daughter, Mali Tova. 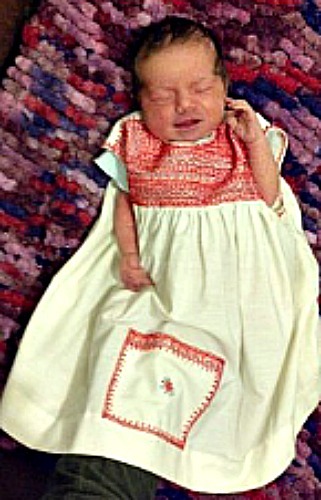 Her middle name is in honor of my maternal grandmother who bought the dress in this picture 40+ years ago for me when she visited Israel. I am so grateful that my mom (who saves nothing) saved this dress and brought it to Israel so that my daughter could wear it when she received her great-grandmother’s name this past May. I love the comments you put on each picture. Your gratitude is pervasive and inspiring! amazing! i loved learning about your life through your photos. Wish I knew you.